Ermioni tavernas are located along the Limani and Mandrakia waterfront, so you will always enjoy your dining experience with a sea view. The Greeks enjoy eating out and it is a real family occasion, with large families, including grandparents, small children and their close friends spending time together. Tavernas are relaxed and informal, it doesn't matter what you're wearing. Greeks normally eat late, especially during the summer months, they tend to have a light lunch around 2:00 pm and dinner starting between 9:00 pm and 12 midnight. Whatever time you go out for your meal, when you get a table, you have the table for as long as you want, day or night. You will never be put under any pressure to leave when you have finished eating your meal. Most menus are laid out in Greek, English, and other languages, so you shouldn't have too many problems reading the menus. Most of the waiters are very friendly, helpful and speak English. They will give you advice and suggest certain meals which you might not have tried before, you should try some of the local Greek dishes. You will always be brought a basket of fresh or toasted bread with your meal which you will have to pay a cover charge for, wether you eat the bread or not. At the end of the meal, you might also receive some seasonal fruit, which can be complimentary. When you are ready to pay the bill you may have to wait to catch the waiter's attention. You'll usually be charged a small cover charge, which includes the price of the bread. Prices do not normally include a service charge, so if you are happy with the meal and service you received, you may wish to include a tip of about 10%-15% of the total bill. 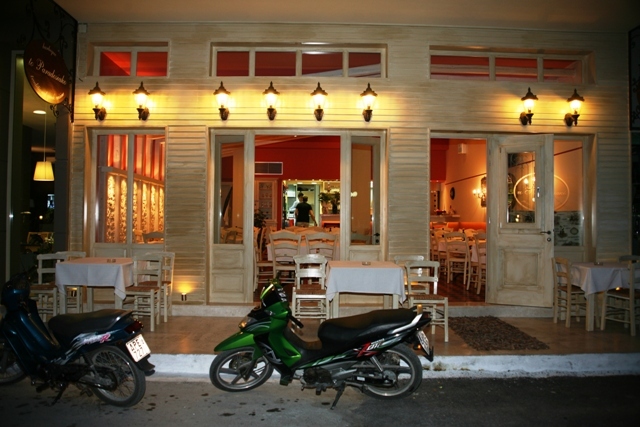 Michalis - Traditional Greek taverna with a good variety of authentic Greek dishes. A good selection of mezede dishes and locally produced wine. Open most of the year. Sit opposite the sea during the summer months and listen to some great traditional Greek music. Friendly owner/waiter service and English speaking. Average prices. Tel: 27540 31551. Kati Psinetai - Costas and his family serve traditional Greek meals and snacks, including meat, fish and vegetable dishes with local wines. A warm and friendly service. Greek is spoken, with a little English, but everyone seems to understand each other. Closed during the winter months. Average prices. Tel: 27540 31980. Cookoida - Opened in the Spring of 2016 and continually developing. Specializing in fish, meat grills and pizza, with many 'home-cooking' recepies available from the menu. Operated by Niki and the Mitsos family, offering a good variety of food and service with a smile. English speaking. Take-away service available. Average prices. Tel: 27540 31287. Veggera - Greek food with Italian style. Pasta, pizza and salad specialities offered in very large portions. A good selection of bottled wines. Open all year round. Can sit inside during the Winter months, or outside under the canopy during the Summer season. Friendly service and English speaking. Take-away service available. Above average prices. Tel: 27540 31231. Souvlaki bar - A modern souvlaki bar selling basic Greek meals and snacks along the Mandrakia waterfront, to eat al-fresco or take-away. Open during Summer months only, with home delivery. English speaking. Below average prices. Tel: 27540 31110. Korali - Traditional Greek taverna, family owned and specialising in fresh sea food. Open most of the year. Sit inside during the Winter, or along the harbour front during the Summer months. Average prices. Kavos - Traditional Greek taverna with new exterior terrace overlooking the bay towards the islands of Dokos and Hydra. A great choice of fresh fish and other traditional Greek dishes. Open most of the year. Friendly service and English/French speaking. You can select your fresh fish from the kitchen, but check on price before placing order. Average prices, but fresh fish meals can be expensive. Tzieries - Popular basic family run Greek taverna. Wonderful sea and island views from the exterior terraces, with the option to swim between courses. Open most of the year. During the Winter months sit inside by the open fire and feel part of 'the family'. Good choice of mezedes, meat and fish. The speciality is squid and their chicken paiydakia. English speaking. Average prices. Bisti - Tucked away in a shaded area opposite the wooded Bisti peninsula and next to the small church of Aghios Nikolaos. Family owned, serving traditional Greek dishes. Closed throughout the Winter months. Open from Easter and throughout the Summer, relax and enjoy traditional food and wine under the shaded canopy, accompanied by old traditional Greek music. Average prices. Maria's - Family run Greek taverna serving home-cooked food since 1969. Offering a good selection of meat and fish mezedes, wholesome meals and delicious sweets. Try their delicious moussaka, chicken salads and rice puddings. Open most of the year. Sit inside the taverna or outside by the harbour front at any time of day. Closed most of January until February. English speaking. Average prices. Tel: 27540 31029. Paradosiako - Authentic Greek taverna, with modern decor, serving various Greek dishes like souvlaki, pitta gyros and kalamakis. Friendly service and English speaking by most of their waiters. Open all year round. The speciality are their Brizola's, large thick cut pork chops, and cheese stuffed Beefteki dishes. Take-away service available. Average prices. Tel: 27540 32277. Ganossis - Traditional family run restaurant since 1918. Large and excellent selection of Greek and European dishes available, including freshly made Italian dishes and their own oven-baked pizzas. Wonderful surroundings and a great selection of bottled wines. Open from February to December. English speaking. Above average prices. Tel: 27540 31706. Veckio's Pizza - Newly opened in Spring 2018, Veckio's Pizza place offers basic eating in or a take-away service. Very popular with young people and family groups for a reasonably priced meal. Open in the evenings. Average prices. Spirandreas - A friendly sea-food restaurant since 1968. Very good standard of Greek and European cuisine with a good variety of wines. Specialities are the fresh fish and large exotic salads. Open April - October. English speaking. Above average prices. Visit the Spirandreas website for more information. Tel: 27540 31380. Pharos - A small, basic but friendly, snack-bar close to the popular Yacht Cafe, the Pharos offers sea-food and 'fish-and-chips' on its menu (although not the British style). Tasty meat, souvlaki and salad dishes are also served. Although you can 'take-away', there are a few tables where you may sit and eat outside next to the sea. Very popular with the locals. English speaking. Below average prices. Mastoras - Tucked away in the old plateia square, is a small basic but friendly souvlaki and gyros bar. This gyros bar was originally located in the old village, and fondly known as the 'Holy Gyros'. One should not miss a traditional meal here, especially the gyros merida and chicken 'special'. Open evenings only. Take-away service. English speaking. Below average prices. Tel: 27540 32291. Karavaki - A small friendly 'Ouzeri' that serves some interesting mezedes, including fish. An intimate little establishment located on the way to, and close to the Hellenic Coast Guard offices. Offering basic traditional meals, drinks and snacks, ideal if you do not want to have a full meal, but fancy a light bite with refreshments. Popular with the locals. English speaking. Below average prices. Politis - Open during the Summer months only. Located on the main coastal road, close to the monastery of Anargyroi, 3 kms West from Ermioni. This traditional Greek taverna serves basic meat dishes such as souvlaki and kalamaki, with traditional village salads, in a large open patio area with great views across Kapari bay towards Ermioni. Closed during the Winter months. Greek speaking, with a little English. Below average prices. Fountas - Located on the coastal road between Ermioni and Petrothalassa, 6 kms West from Ermioni. A traditional taverna which offers live Greek folk music and songs on Saturday evenings, in a pleasant outdoor setting surrounded by trees and plants. Offering good basic food, the present owner used to run To Steki on the Mandrakia side of Ermioni. Very popular with the locals. English speaking. Below average prices. Tel: 27540 31151. Iliokastro (see map in photo gallery) is a small mountain village situated 9 kms north-east from Ermioni. The village is known for its quality wines and olive oil, which are produced in the area. It has a number of good tavernas which are worth visiting, especially during high summer, as the air is cooler than Ermioni. Local traditional foods are prepared and served in a community environment. However, no fish is available in any of these village tavernas. During the winter months, some tavernas do have a log burning fire, which creates a very warm romantic setting. 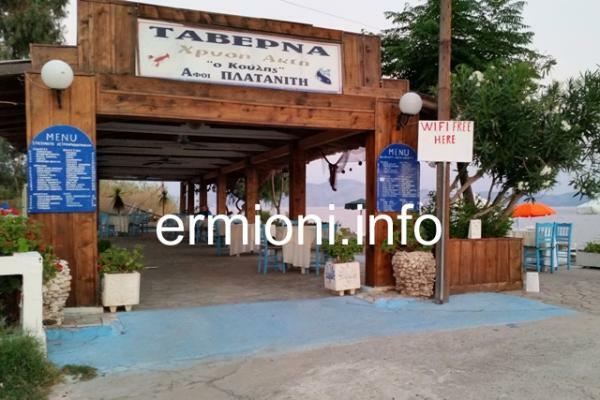 Arhontiko - Located 8 kms from Ermioni, on the right hand side of the main road, this stone built taverna offers a wide selection of Greek appertizers or mezedes besides traditional main dishes. Eat inside or out on the large open terrace. Open during the Summer months. English speaking. Average prices. Maryvonne - Located 8.5 kms from Ermioni, serves delicious Greek food with a French influence. The speciality is the home made wine made by Yorgo himself and the rib beef for four cooked on the outdoor BBQ. All food is prepared by Maryvonne and Yorgos themselves, even the bread, which is made in the outdoor clay oven. Open all year round apart from mid December - mid January. Closed Mondays and Tuesdays. Greek, French and English is spoken. Above average prices. Tel: 27540 91352. 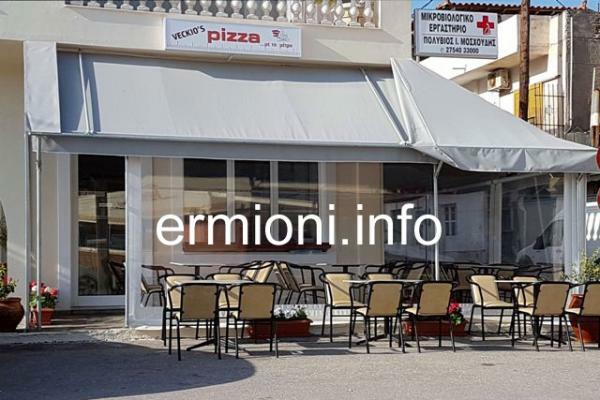 Aderes - Located 8.25 kms from Ermioni, on the left side of the main road. Aderes is a large taverna catering for functions and large parties, although couples and small groups are made very welcome. Serves traditional Greek food, including home made feta cheese and wine. Popular with the locals and great value. Open all year round. Greek spoken with a little English. Below average prices. Taverna Louis - Originally known as Kokoras Horiatikos - Located 8.25 kms from Ermioni, on the right hand side of the main road, is a large taverna which is where one will find the locals, enjoying traditional Greek food and local wine in a friendly environment. Open all year round. Greek and English speaking. Average prices. Boykoyris - Located 13 kms from Ermioni and the only taverna in this small traditional Greek mountain village. All the food is freshly prepared and cooked by the friendly owners Joanna and Yiannis, their 'flaming' cheese saganaki is a speciallity. Greek and English (Canadian) spoken. Open all year round. Closed on Wednesdays. Excellent value for money. Below average prices. Well worth the scenic mountain drive. Tel: 27540 91358. 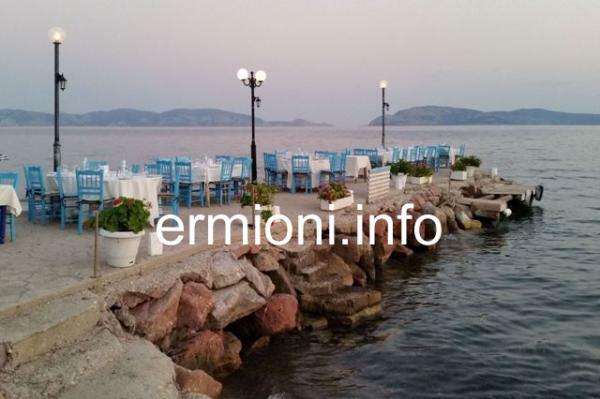 Koulis - Located 15 kms East from Ermioni, this traditional family taverna is situated next to the sea and has its own beach with pier. The taverna has a really friendly Shirley Valentine feel about it, with great views towards the islands of Dokos and Hydra. Established many years ago, taverna Koulis offers good food and refreshments. Fresh fish a speciality, with the occassional Greek folk dance thrown in by the two brothers. Open all the year, with apartments available nearby. English speaking. Average prices. Tel: 27540 41385.